Director/Writer: Boris von Sychowski / Writers: Lorenz Stassen & Ryan Carrassi / Cast: Kristen Miller, Elena Uhlig, Thorsten Grasshoff, John Hopkins, James McAvoy, Jason Liggett, Jonah Lotan, Isla Fisher, Cordelia Bugeja, Maximilian Grill, Lynda Rybová, Bryan Carney. The triangular formation of pretty young faces tells us where the influence for this collaborative European venture hails from. The Pool even starts with the old girl-tormented-in-house routine, as a planned dinner date is crashed by a skull-masked machete-swinging schizo. At the International Highschool of Prague, exams wrap up and everyone wants to party, which is the big thing for rich, popular man-about-campus Gregor, who is renowned for his amazing secret after-parties. Obv heroine/American Sarah is smart and nice, everyone’s friend blah blah blah, while her German BFF, Carmen, is the promiscuous siren. There’s also Scottish bloke, British bloke, American bloke, German bloke, Australian girl, Czech girl, and girl-whose-accent-I-couldn’t-place. Scottish bloke and Australian girl are boyfriend/girlfriend, and also happen to be played by bona fide Hollywood A-listers to be James McAvoy and Isla Fisher. No big name should go without having been in a teen horror film before hitting the big time. It’s law. Anyway, She’s screwed up her final and is a bad mood, which lends well to her storming off and being the next one to meet Mr Skullface, who stalks her through the woods in an effectively pumped chase scene. After the official school graduation ball thingy, the gang meet up and Gregor leads them convoy style to a pool complex outside the city. Swimsuits are provided, nobody knows they’re there, and they successfully jimmy their way into the bar. Awesome times ahead. Well, awesome times would be ahead were it not for one of the group having stopped taking their meds, slaughtering his own stepsister, and is now among them at the party. But who, who? A grumpy detective in on the case, but he inexplicably speaks English to his Czech colleagues and says “damn kids” a lot. He’ll be useful. Up next is the infamous waterslide murder. An inventive set piece I’m sure we’ve all worried about at one time or another while sliding down the inside of a plastic tube towards God-knows-what. What if there’s crap in the splash pool? Or a dead body? *gasp* what is something sharp penetrated the floor of the slide!? See the results in this old Icky Way To Go. Ouch. The murders are discovered and the group find that they are locked inside. Spitting into two groups, as numbers deplete, Sarah’s friends try to convince her that Gregor (elsewhere) is the most likely suspect. He brought them there. He made loads of suspicious statements earlier. 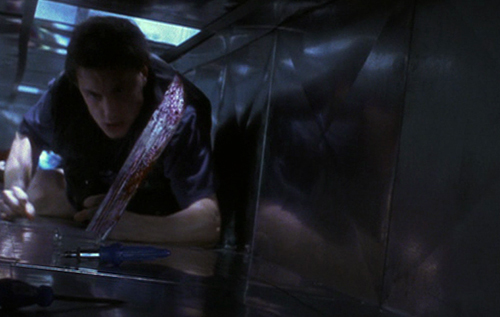 One half of the group attempts to escape through the venting system, only for the killer to start piercing it with the machete. By this point it’s fairly obvious who the killer is, and it was a bit of a ‘that old chestnut’ situation as it’s revealed to be – yawn – the British guy, but the actor does a fine job of camping it up as he goes head to head with hydrophobic Sarah. 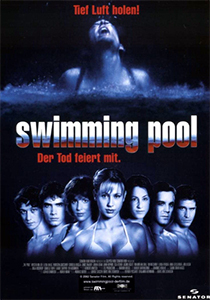 One distinguishing feature of The Pool is that not everyone else dies, there’s quite a number left intact by the time the credits roll. It’s helpful, as it offsets the weight on Kristen Miller’s shoulders, as she’s something of a cookie-cutter final girl, all deep trauma and niceties. Normally, the promiscuous girl who, it turns out, bedded Sarah’s boyfriend, would be sliced in no time, but she actually ends up saving the day here. 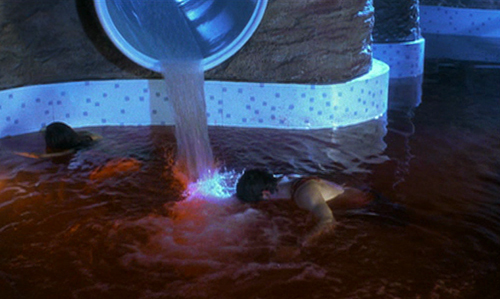 The refresher comes from the cross section of accents and looks; the film was initially going to be a German-language homegrown production (evidenced by three of the five surviving characters being German), but cottoned on to the global market well enough, is produced with enough gloss to rank well as one of many Scream knock-offs, and doesn’t shy away from the bloodletting in favour of laughs. One eyebrow-raiser is the “advanced age” of several of these “teens” – some of them look like they should be thinking about retirement rather than graduation. A fun diversion, aided abundantly by Prague’s beautiful scenery, and some ambitious ideas. The sort-of sequel is merely a re-edited Do You Wanna Know a Secret? with some new scenes tossed into the salad. As there’s no way in hell I’ll ever subject myself to that film again, I’ve not exposed myself to it. Blurb-of-interest: Miller was the bitchy girl, Cindy, in Cherry Falls.